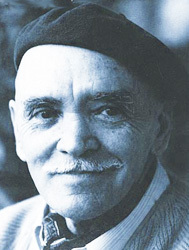 Howard Murphet was a lifelong theosophist and biographer of discredited 'spiritual' figures among Theosophists (eg. 'When Daylight Comes': A Biography of Helena Petrovna Blavatsky and also a biography of Colonel H.S. Olcott). He was enthused by the Paul Brunton, Yogananda and many more such claimants of on doubtful premises having 'spiritual wisdom' before he learned of Sathya Sai Baba. Murphet was also one of the earliest propagators of the Sathya Sai Baba mythology, the man who claims to be Shirdi Sai Baba reincarnated. The success of his first Sathya Sai Baba book 'Man of Miracles' was no doubt largely due to the 'once-upon-a-time fairytale account of a kind that innocent children have imagined about amazing miracles, heavenly spheres, incarnate spirit guides, wise holy saints and masters and the wonders of God would believe. Many adults are in search of their childhood faith, and Murphet (and Sai Baba himself) strive to prove that it is all true! He helped convince many non-Indians about the miracles that Sathya Sai Baba has himself claimed were simply done to attract people to him (what he calls 'visiting cards') and to his doctrine. Westerners were drawn to visit this self-proclaimed God Incarnate, saviour avatar of the age, and this too in turn convinced many otherwise skeptical Indians. (Meanwhile, many of the miracles have widely been shown to be fraudulent both by film and video and by testimony from many who spoke out). ''Not Perfect'' Murphet’s 'imaginative' reporting: It is misguiding to present one's beliefs as if they were authoritative fact, however well-meaning the intention in so doing. It occurs often, even by the otherwise accurate Howard Murphet, who fails to draw the line between his own imaginative beliefs and what is unobservable or unproven fact... such as about the existence of great spiritual masters like those highly-elusive - indeed wholly undiscoverable - figures of Blavatsky's and W. Leadbeater's doubtful accounts like the supposed masters El Moya and Kuthumi, or his baseless and naively-uninformed belief that Aurobindo influenced Hitler by psychic power and caused him to attack Russia at the wrong time, so losing the war!, thus eventually to save the world from Nazism Well, not many historians know that, for certain!Murphet wrote, "Sri Aurobindo... stated during the war that if the Axis forces of tyranny and darkness won the war, the divine plan would be set back by a thousand years. So he himself played a powerful part to ensure that victory went to the Allied forces of individual, democratic freedom." Aurobindo took Hitler literally about the Thousand year Reich, it seems. But in fact Hitler planned to attack Russia long before the 2nd WW. The entire vast plan was developed by the German High Command on Hitler's command as ‘Plan Barbarossa’, but it had to be delayed due to a Balkan diversion caused by British destabilization of the area which experts agree was considered expedient to delay Hitler’s Russia attack. The timing was put back by some weeks and Hitler ordered the attack immediately just as soon as he had enough forces available again. "Yet a deeper current was underlying this clash of material interests; the current that goes back to at least the age of Rama, the underlying struggle between Might and Right, between the Light and the Dark forces. World War I was really a forerunner of the next war involving almost the whole of the world and known as World War II. Here we see more distinctly and clearly the struggle between the Light and the Dark. The young Avatar, Sathya Sai Baba, was twenty years old when this war ended. His spiritual power had no doubt helped in the victory of the forces of Light. Another great spiritual leader of the time, Sri Aurobindo, whom Swami had named an Avatar of the Individual, stated during the war that if the Axis forces of tyranny and darkness won the war, the divine plan would be set back by a thousand years. So he himself played a powerful part to ensure that victory went to the Allied forces of individual, democratic freedom." 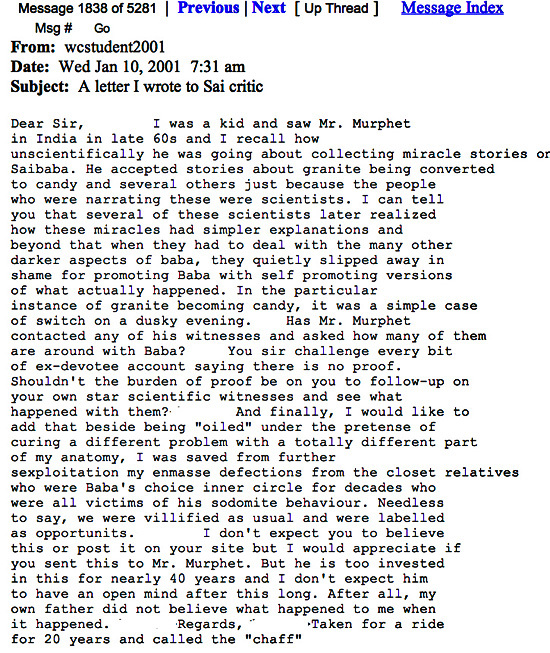 Such ‘spiritual imaginings’ that Murphet indulged in on that weaken his credibility when he relates other amazing incidents, even personally-experienced events with Sai Baba. Like virtually all other authors on Sai Baba, Murphet was evidently not in any way inclined to question anything he was told by others about Sai Baba or their own experiences. Unfortunately, he interpreted all his experiences and diverse hearsay within the ‘received wisdom’ that controls the minds of the converted. This lends more weight to Sai Baba's occasional comment "Murphet, not perfect". No doubt Sai Baba can 'cold read' people's thoughts very well - but to leap to the conclusion that he is directing world affairs and bringing about great changes is truly an unsupportable thesis based entirely on devotional zeal. It was Gorbachev and others who backed him who brought about the great change in Russia, impelled by the consequences of massive economic events over decades. Satya saw the need of this. `Bring me those jasmine flowers', he said, pointing to a large bouquet in the room. The flowers were placed in his hands, and with a quick gesture he threw them on the floor. All present looked in awe: the flowers had fallen to form the name `Sai Baba' in Telugu script, the language spoken in the village. This flower-writing was not something that required imagination to help; the words were strikingly clear, as if arranged with meticulous skill, all the curves and convolutions of the Telugu letters perfectly reproduced." Murphet, Man Of Miracles, p. 59. As Professor Dale Beyerstein has remarked "...the event Murphet describes occurred long enough in the past that reconstructing the exact sequences of events from the memories of witnesses would be futile in both cases. However, this effect is easily explained using basic principles of conjuring such as the highly histrionic Sai Baba had every opportunity to know about. Sai Baba was born into a theatrical family, and learnt stagecraft from his earliest childhood." (See Kasturi, Sai Baba, Vol I. pp 20-50; Premanand, Lure of Miracles p. 68). "As for these petty and ridiculous allegations about God, one whom we should have measure with the measuring tape of the ordinary human mind I myself pay no heed to them whatsoever. They arise through the activities of some egos, anxious either to bring the Great One down to their own level so that their own personal egos may grow as they try to climb the ladder of Divinity and at the same time they are serving the dark forces, that are baffling hard today against the great Light that the Avatar is shedding on earth. And I know too, that He is being supported by man workers in the force field of light such as the Ascended Masters, two of them who I had much to do when I was researching the biographies of the outward founders of the Theosophical Movement. They are Master El Moya and Master Kuthumi who are two of the most powerful masters behind the launching of the Theosophical Society last century. Those working against the Avatar, unless they go to the unredeemable level of becoming demonic will someday in some life come back to the Divine Feet. This I pray and for this I send them my Love." Howard Murphet was totally convinced of many notions other than those already pointed out, beliefs which have long been discredited and rejected by most of the respected scholars of Indian religion, its main spiritual leaders and certainly by serious investigators of the paranormal. Meanwhile he pays no heed to the allegations yet considers himself in a position to evaluate or judge them as "petty or ridiculous" - and without any questioning or investigation whatever! His fanciful account of why the allegations were made and "at the same time serving dark forces" only expresses the deluded nature of his own mentality. Add to that the preposterous idea that those who give sworn testimony that they were abused sexually by Sathya Sai Baba - and all the other dissidents - will have to return to Sai Baba's "Divine Feet". What poppycock! Murphet gets on his highest horse when he claims that those who will not return to the abuser of faith will go to the "unredeemable level of becoming demonic". This is sheer black-white, good-evil mental blockage, a level of what was unredeemed delusion he had sunk to. Yet he sends them his Love (in capitals)... a cheap gesture, and who among them would welcome his loving hypocrisy? The quote on the right shows how he believed outright in the existence and wisdom of El Moya and Kuthumi - the imaginary 'invisible masters' living hidden in the Himalayas who the bogus spiritual claimant Madam Blavatsky claimed she had met (herself being exposed for manipulations made to loom like materializations and other deceits. Not least the promotion of the boy Jiddu Krishnamurti as the figure of Maitreya/Christ come again, which the adult Krishnamurti himself rejected and even pooh-poohed, thereby bringing the Theosophical Society into huge disrepute). He says portentously that he "had much to do with them" while researching theosophical biographies... but he never met either nor did he have any communication with them (as Blavatsky claimed she had through mysterious means). This shows how Murphet was once a theosophist and always a theosophist at heart. Murphet claimed further "The two Masters stated in the book "The Light Will Set You Free" that, "Avatar Sai Baba is carrying the Divine-consciousness in the world today." This alleged book (which is nowhere available as far as can be discovered) was presumably penned by Blavatsky herself, claiming she channelled it from her Masters. But she dies in 1891, ages before Sathya Sai Baba was ever heard about. (Not that that would affect a true believer - for they also believe in prescience!). So-called 'chanelling' is itself is highly unlikely to be genuinely what it is claimed to be. It is now known on a developing empirical basis that the brain can 'apparently' split the mind so it 'talks to itself, hears a voice as different from the conscious subject'. This phenomenon is being studied with the amazing new instrumentation and vastly more commodious techniques of 21st century neurology and will no doubt lead to confirmation that all such apparent messages from the beyond or some entity within are nothing but the result of separation from oneself based the dual nature of the brain's hemispheres. (Much scripture is of this nature - the Koran as a major example). This phenomenon is especially intense in schizophrenia and other psychoses where voices are heard instructing the sufferer to do all manner of things... to preach some doctrine, to attack and kill people and so on. There are channellers of Kuthumbi (eg. Lynette Leckie-Clark) and numerous promoters of the slogan "The Light Will Set You Free" operating their spiritual business even today as a Google search will show. "His Purpose was to lead those who are ready, to their own inner Guru or the God within. I did not immediately accept Him as an Avatar, but after He taught me in a humble manner what an Avatar is and how we are all Avatars, descendants from God without being aware of it. As I stayed on I became more and more certain that He was indeed an Avatar. This is not based on the fact that He materialises things. I know that there are others in India who have the siddhis for materialisation. Some of them are masters on the right hand path, others on the left hand path or the black magicians. In most cases they have trained servants in the astral realm who carry things for them as they desire. I mean material objects such as trinkets, food, and so on. So, you might say the fact that Swami materialises thing is really no proof that He is an Avatar of God." As shown, Murphet was already a believer in some of the most unlikely myths and impossible claims long before he discovered Sathya Sai Baba. He accepts Sai Baba's miracles without question, as his series of hagiographic books praising him proclaim on a wide front. Apropos, he also detected a miracle on a photo he took... a strange light that had spiritual significance for him. He asked Sai baba what it meant and was told it was an effect of an error in the photographic printing process! This shows how he developed a readiness to belief anything connected to Sai Baba without a second thought. On what basis he can decide that Sathya Sai Baba is not what he calls a "black magician" on the "left-hand path" is unclear, except his gratitude to and admiration for Sai Baba's words and person. He believes he had a miracle cure from Sai Baba, but this happened after a dream and could be explained otherwise, as many known and similar cases of so-called spontaneous regeneration would suggest. He asserts of 'masters' that "In most cases they have trained servants in the astral realm who carry things for them as they desire." This he does not attribute to Sathya Sai Baba, even though he must have known as all followers once did that Sai Baba had repeatedly said in interviews to various persons after apparently 'fetching' something out of 'thin air' such things as "my helpers are very swift". According to Murphet, Sathya Sai Baba "…told Valmai Worthington to tell the 'Pink Twins' from Australia to be cured of their arthritic knees by him. He even told them to cancel their appointments for knee replacement surgery. Tony Clery also states; "I was a member of the SWARA centre - where Dorothy and her sister worked -, for the years 1986 and 1987, with partial year attendances through to 1992, after that my Australian attendances were in the Sydney Centres only, and I was the secretary of the Vancouver Sai centre and was well known in Canada. My friend lived with them, and my children knew them both as well. So it was more than a passing acquaintance. There is even a photo of me working as a volunteer there. It was sent to India, perhaps it is in the book with all the others. Well folks that was it, next time in Oz I saw her at the 'Wayside Chapel' in Sydney she was uncured for all to see... ...The fact remains Dorothy was in a wheelchair in 1993 and still up to her death in 2003 as indicated by her sister and ABC."